Jimmy Page casts light on the unreleased material in new issue of MOJO, out in the UK now. MARCH 25, 2014. MOJO is among the select few of industry types and label acolytes to be invited to Olympic Studios in West London to hear a sneak preview of the companion discs that will accompany the remasters of Led Zeppelin’s first three albums. This is the first time that anyone outside of the band’s immediate circle has heard any of this unreleased material and, as a result, we are sworn to secrecy. These days Olympic Studios is a private members’ club with photos on the wall of some of its famous former clients. The Stones loom large, as do Led Zeppelin who, in late 1968 during a series of sessions funded by Page, cut their first album there. Today, Page is back at Olympic to personally introduce a selection of the unreleased tracks that will accompany the newly polished versions of the classic albums, released in chronological order starting with the band’s first three albums. As anyone reading this should know by now, each album will come with a companion disc that will accompany the deluxe audio packages of the albums in all formats. “I’m lucky that I remember so much of what we did,” he tells your correspondent, discussing the opening of the Zep vault. “A lot of the time the tracks have obviously all got the same titles on the boxes, although there were some with working titles, but when it comes down to it, I know what’s what. The idea of this kind of archival reissue campaign is something that Page has toyed with for quite some time. 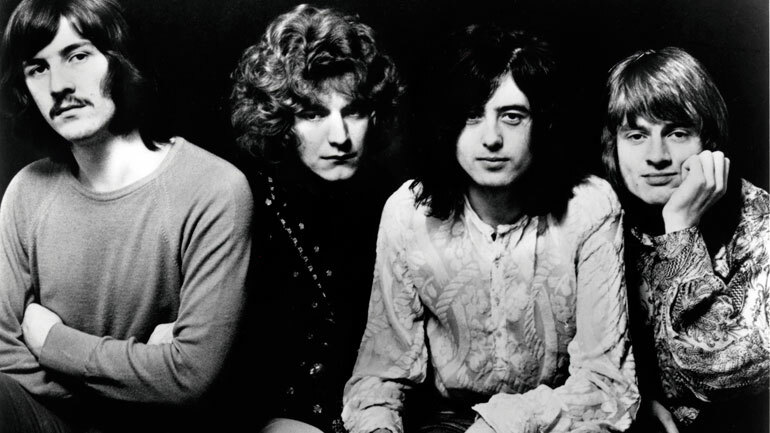 Of Led Zeppelin’s first three albums, the only one not to have an additional disc of studio material is the band’s self-titled debut. As a result, Led Zeppelin will come with a much-publicized live show from the Paris Olympia in 1969 which was originally recorded for French radio. Led Zeppelin II and III, meanwhile, come with an additional disc of what Page calls “working mixes” that were produced during the course of the sessions. “It’s not a mirror image of the original album because it can’t be exactly that,” says Jimmy. “That’s why it’s a companion. Essentially, according to Page, the companion discs show Led Zeppelin at work, assembling the songs which have helped define modern rock music as we know it. From the companion disc to Led Zeppelin, recorded at the Paris Olympia, October 10, 1969 The opening salvo from Zep’s Parisian show features a stomping crowd as the band launch into a burst of Good Times Bad Times which then cuts into Communication Breakdown. Bonham’s cymbal hiss is audible but the dynamism of the performance is almost overwhelming, John Paul Jones’s bass driving the sound forward, and Page offering up a liquefying solo. There is no doubt that this is a warts-and-all performance – Robert Plant’s vocal drifts a tad out of pitch – but the heads-down, improvised finale is staggering. From the companion disc to Led Zeppelin, recorded at the Paris Olympia, October 10, 1969 The customary slow-crawling blues tune you know and love. Again, the rhythm section are in staggering form. Equally, Page’s guitar sounds nasty – filthy in fact. Plant’s vocal interchange with Page’s guitar is also a fine indicator of Zep’s understanding of the dynamic possibilities offered up by the blues. Oh, and as with the first track, You Shook Me is unrepentantly LOUD! From the companion disc to Led Zeppelin II. This alternate mix appears to offer a different set of dynamics from the version you know and love. Bonham appears to be higher in the mix, while Page’s solo appears to be different from that on the final version included on the original album. If anything, this track swings a little harder than the final version, although the latter is clearly more polished. From the companion disc to Led Zeppelin II. The chorus of Whole Lotta Love is one of the oddest moments in modern music. Listening to this version of the track without the chorus, however, is brilliantly disorientating. The removal of echo in the middle section allows Bonzo’s work to shine brighter but, again, creates the sense that the listener really is witnessing a song being assembled. Plant’s vocal performance is different, Page’s solo is missing, but the track’s momentum remains intact. A minimalistic and yet utterly revelatory version. From the companion disc to Led Zeppelin III, recorded at Olympic Studios. Is that a different guitar figure at the start? Hard to tell on one listen, but it’s certainly a different mix. A more taut version of the track, if anything. The guitar sounds more defined. The music moves less but somehow it sounds even more hypnotic thanks to the repetition. “It’s one take and you can hear how we’re moving around it at the end,” offers Page. From the companion disc to Led Zeppelin III Another different guitar intro? It’s certainly a different middle section. The Hammond sounds phased and more prominent and more florid that the version included on III. This version isn’t as finessed, but it is no less absorbing, Plant’s vocals sounding more emotive that the more familiar version. Once the track finishes, the audience at Olympic are forced to applaud. “It’s an earlier take. The energy is so raw. It’s really moving,” says Page. From the companion disc to Led Zeppelin III. The emotional power of Since I’ve Been Loving is impossible to match and, dazed by the former, it is hard to focus on this version of one of Zep’s most heroic tunes. The vocals on the final section, however, do sound different and there is a sense of this being a work in progress. From the companion disc to Led Zeppelin III. A totally unreleased pair of country blues covers, cut from the same cloth as Hats Off To (Roy) Harper and featuring only Page and Plant, the latter blowing hard on a harp cranked through a Vox AC 30. “I eat my breakfast in California / I eat my dinner in Carolina,” hollers the singer on a faithful version of Trouble In Mind, the eight-bar blues which Big Bill Broonzy made his own. These twinned blues work-outs bring Page’s preview to a close.